Indiana appears to be mixed regarding poker and gambling in general within state lines. On one hand residents are able to participate in various poker games at one of 10 or so casinos in the state. On the other hand, other forms of gambling are illegal which includes online poker and home games. Are there any loopholes to exploit? That's what we cover in more detail below. Indiana was one of the first states -- not to mention is one of the only states -- to specifically mention online gambling. It's clearly illegal under their laws, for both operators and players. So you can't play at poker sites in Indiana. There is another important point to takeaway here, too. Poker staking is likely to be illegal, too, because Indiana laws mention "transactions directly involving a person located in Indiana." So if you stake players to play poker, either live or online, I would stop and double check with your lawyer before continuing. Indiana mentions nothing about home poker games or social games. However, I would assume it's illegal, too. Card games, under Indiana law, are considered to be games of chance, and therefore fall under the unlawful gambling laws. Do Casinos in Indiana Offer Poker? You'll find over 13 casinos in Indiana that offer any game you'll find in Las Vegas. This includes slots, craps, blackjack, roulette and mini-baccarat. Poker games include holdem, omaha, stud and more, as well as WSOP circuit events. Two popular casinos include Blue Chip Casino and the Majestic Star. We receive a lot of questions about state poker laws, and more specifically, the gambling laws in Indiana. We thought it'd be helpful to post those here for you. Will real money online poker be regulated in Indiana? Since their current gambling regulation laws that were set in 2005, Indiana has not put forth any more effort into new online gaming laws. 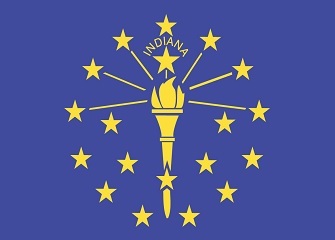 Experts and other poker webmasters alike think that Indiana agreeing with neighboring states (for intrastate poker and casino gaming) is a real possibility in the near future. Is there an online poker room that accepts players from Indiana? Surprisingly, yes. Considering how strict Indiana appears to be about online poker and home poker games, you'd think that US poker sites would exclude residents from signing up like they do all the other strict states. However, that's not the case. You're still able to sign-up to (nearly) all US accepting poker sites, such as BetOnline, Bovada, Carbon Poker and Americas Cardroom. What other forms of regulated gambling is offered in Indiana? More specifically, between their land-based and riverboat casinos you'll find a variety of games including craps, roulette, poker and blackjack. Slots and off/on track horse racing is available, too, as is a state lottery. Where can I read more about Indiana poker laws? Here are some interesting facts about gambling and poker in the state of Indiana. The law regarding gambling riverboats originally prohibited them from operating casinos games while docked. Now you'll find that all riverboats are docked. The original law allowing gambling riverboats required that they "fairly replicate nineteenth century Indiana steamboat passenger vessels" if they were to operate on the Ohio river. ISPs have the right (by law) to block emails that pertain to online poker and gambling.